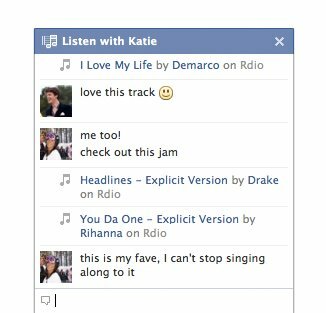 Facebook has announced a new way to listen music with friends. It is possible with one of the music services of Facebook. This feature will start rolling out over the next few weeks. We hope you enjoy listening with friends! This feature lets you listen along with any of your friends who are currently listening to music. Moreover, it is now possible to listen together in a group while one of your friends plays DJ. You can listen to the same song, at the exact same time—so when your favorite vocal part comes in you can experience it together, just like when you're jamming out at a performance or dance club. It is required to check for the music note in the chat sidebar to see which of your friends are listening to music. If you wish to listen to the same music, just hover their name and click the “Listen With” button. Now, the music will play through the service which is used by your friend. If a new song is played, you will come along for the ride and discover the new music while your friend DJs for you.